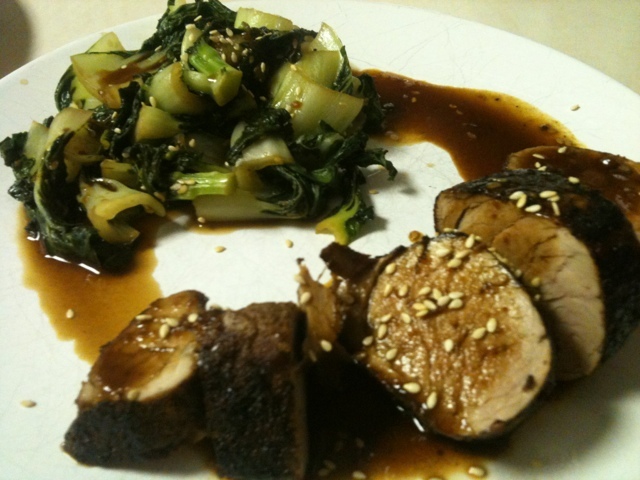 food: 7-spice pork tenderloin & bok choy | eat. drink. fly. this meal had a few inspirations… first of all, it’s a house favourite. my husband makes a homemade spice blend that he fouls up my coffee grinder with, but it is damn tasty. we call it “tyler 7 spice” in my house… and it’s a delight. sometimes, time permitting, the whole spices will get pan toasted before hitting the grinder, but it’s not necessary. he then takes most of the spice rub and coats a pork tenderloin with it… and the remainder goes into a sauce containing various things, based on current whims. this week’s sauce included soy, fish sauce, sugar, sesame oil, orange juice and maybe a few other things he forgot to tell me about. it happens. so, first things first, you have to sear off that pork tenderloin. tenderloin is best cooked, IMO, to medium well. just a hint of pink in the very centre, but done on the edges. to achieve this, i seared it on a reasonably high (let’s say on 7/10) on all sides for a couple minutes and then turned it down to 4, put a lid on it and roasted it until the internal temp read 140. then i removed it, tented it and let it rest up to 150. it was perfect. for the bok choy, i threw the sauce mixture in the pan, loaded the bok choy on top, slapped the lid on and left it for 5 minutes. then removed the lid & continued to stir until it was at desired doneness. i plated it and cut the pork while the remaining pan sauced reduced a little more into a sweet salts glaze. added some toasted sesame seeds and sauced the plate and voila! she’s already lost 30lbs, which i find inspiring and amazing! (go girl!) but i’m also really enjoying her pics of meals that follow the paleo diet. as someone that is totally addicted to white bread (or really, any bread) this scares me. no, seriously, i’m actually eating 2 pieces of white bread toast RIGHT NOW while typing this, lol. but i know that it’s not good for me… but like smoking and drinking, i do it anyways, because the enjoyment factor is high. i can, however, change my mindset if i BELIEVE the logic behind something. like when i went vegetarian for a few years… and when i decided to eat local… and when i stopped buying prepackaged preservative filled convenience crap that masquerades as food. and this paleo diet intrigues me. i have no doubt that you would drop a ton of weight by following it and that your body could live and function happily on it. and giving up dairy would be doable, sugar the easiest i think… but that devil wheat. in fact, no grains at all! see, i may be able to survive if i could still eat rice and quinoa and those other yummy things… but no grains at all is very scary. so basically i’m just trying to phase them out a bit. more veg, less grain. and trying to keep breads out of the house. because i am powerless against them and clearly should not be trusted. in any event, i enjoy reading about this stuff, so it’s been a good exercise in learning. Soooo….no grains = no beer?